After thinking about what I had in my cupboards (black beans) and what dressing I recently fell in love with (the avocado vinaigrette), I decided that what I really wanted was to make a spicy sweet potato and black bean salad. It was as if all of my recent desires came into one: my lifelong love for black beans, my scouring the farmer’s market for seasonal produce, my exploration of making homemade salad dressings and my desire to increase my tolerance for spicy food. 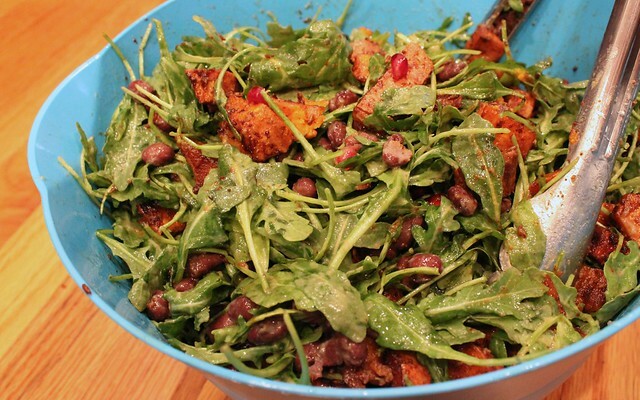 Yes, they all came together perfectly in this sweet and spicy baby arugula salad. Growing up in a Cuban household, I don’t remember having a lot of white potatoes. To be honest, it was all about white rice (and black beans) in my house. What we did have, however, is the Cuban sweet potato, also known as boniato. It looks just like your typical orange/pink/brown-skinned sweet potato, except it is still white on the inside. To be honest, the boniato is just not as sweet as a traditional sweet potato–so for this particular dish, I decided to go with the golden fleshed variety instead. Since I was going to be adding a lot of spice to this recipe, I needed the sweetness for balance. Plus, sweet potatoes are also full of vitamin A, C, B6, manganese, potassium and fiber. When choosing to make a potato dish these days, I tend to stick to this healthier version. And roasting them is the perfect way to bring out some of that sweetness I craved. This salad was really easy to make, actually. All it took was my avocado vinaigrette, some roasted sweet potatoes and a few other ingredients. The surprising part is that it made a pretty huge batch. In fact, this salad serves eight–which meant I had lunch for over a week! It was a little intense to have this every day for over a week, but worth it. In fact, I’m still finishing it up! The only thing I have to warn you is that this salad is definitely very spicy. Granted, I’m still getting used to spicy food but anyone not used to a pretty high level of spice might have trouble eating this one. You can actually cut the spice in half (that means 1 tablespoon cumin seed, 1/2 tablespoon cayenne, 1/2 tablespoon chipotle pepper, 1/2 tablespoon chili powder) and the salad will still be delicious. My favorite part is actually biting into a spicy roasted sweet potato at the same time as I bite into a sweet pomegranate seed and feel those red juices mixing with the flavors of the chili peppers. It’s a perfect taste of this time of year. With the seasonal produce being so fresh, and the really nice combination of sweet and spicy, I’m even considering making this salad again for Thanksgiving. I know I can’t go wrong with it. A spicy, warm salad is a great way to stay healthy during the cold winter months. If desired, cut the heat by reducing the cumin, cayenne, chipotle and chili powder by half. Take the sweet potatoes, wash the skin thoroughly and then slice them into ½-1 inch pieces. 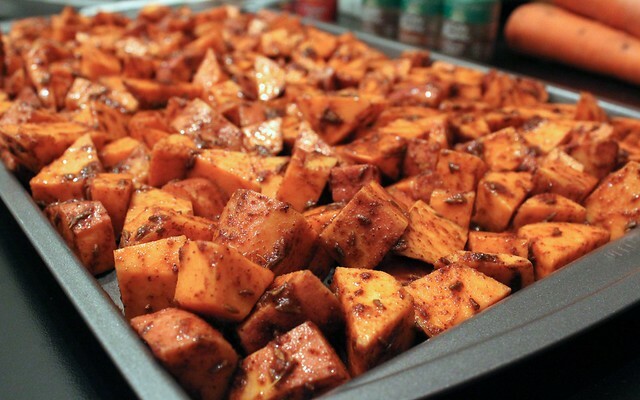 In a large bowl, combine the sweet potatoes, sea salt, cumin seed, cayenne, chipotle pepper and chili powder. Mix thoroughly. Spray a large baking dish with olive oil, then lay your spicy sweet potato mixture on it, making sure the potatoes are spread evenly. Place in oven and roast for 45 minutes. Meanwhile, make your avocado vinaigrette. 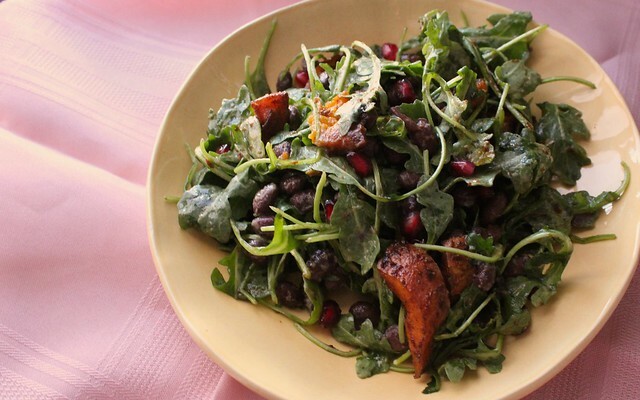 In another large bowl, combine the baby arugula, black beans and pomegranate seeds. Once the spicy sweet potatoes are done, let cool for 10 minutes. Finally, combine the sweet potatoes into your salad and pour in the avocado vinaigrette. Toss the salad, then serve. Do you have a favorite warm or spicy Fall salad? 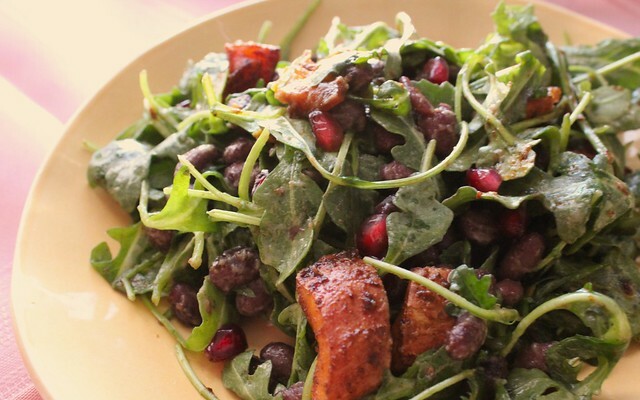 This entry was posted in Fall, Gluten-Free, Salads, Spicy, Vegan, Vegetables, Vegetarian and tagged arugula, black beans, pomegranate seeds, salad, spicy, sweet potatoes by Irina Gonzalez. Bookmark the permalink.